You can protect your installer contents with encryption (7-Zip contents is encrypted using built-in AES method), single or multiple passwords (end users are asked for a password), a trial expiration date. 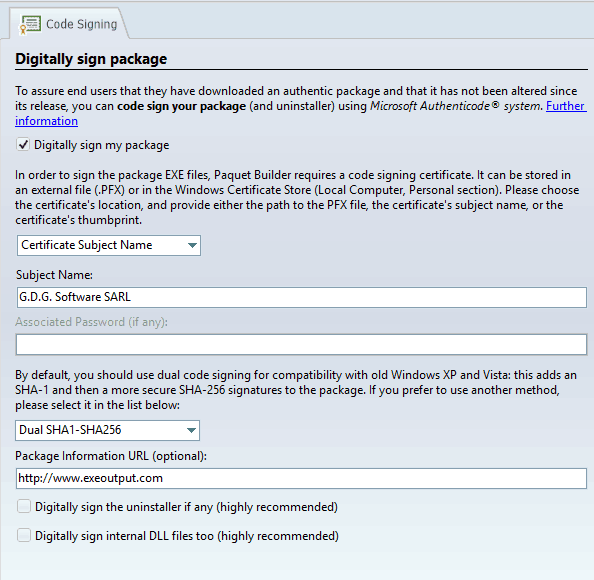 Digitally sign your installer package if you have a publisher certificate (with Microsoft Authenticode code signing). Digital signatures are perfect for Web distribution as they constitute a guarantee that installers and update packages were not altered since their build. Paquet Builder handles all code signing operations itself automatically. Our code signing utility accepts SHA-2 certificates (as required in 2016). You can choose the digest method for the digital signature: SHA-1, SHA-256 or dual SHA-1+SHA-256. Dual code signing is possible on Windows 8 and later. Time stamping uses "RFC 3161 compatible" timestamp server in addition to Authenticode timestamp server when possible. Perform integrity and size checks to avoid bad downloads (truncated file for instance) or unwanted external modifications (CRC32). Extract password protected (encrypted) files, password may be provided, or end users may be prompted. Perfect for silent installation packages. Distribute your files safely in .exe packages. Files are checked during extraction to see whether they were successfully delivered to end users.